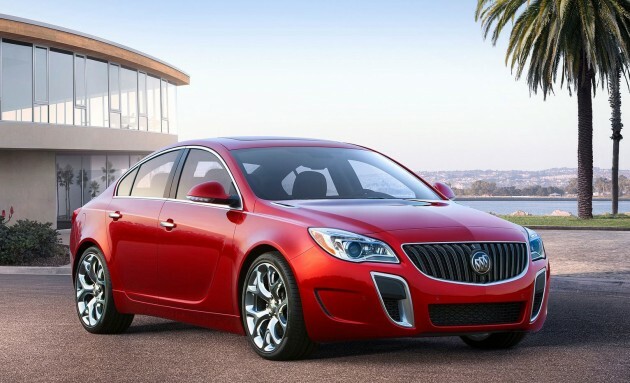 Buick has given this handsome car, the 2014 Buick Regal, a debut at the 2013 New York International Auto Show. The Regal is based on the European Opel/Vauxhall Insignia and is sold as a Buick in USA and China, where the brand is highly regarded as a luxury marque. There are some minor design changes for model year 2014 such as scalloped headlights, a mild facelift and a long chrome strip linking the new LED tail lamps. Inside, the Regal gets a revised instrument cluster and infotainment system. There are also less buttons now on the center stack. Turbocharged variants (Regal Turbo and Regal GS) now get Haldex all-wheel drive. The Regal Turbo’s 2.0 litre four-cylinder turbo gets 18% more horsepower, raising figures from 220 hp/353 Nm to 259 hp and 400 Nm. These figures are the same for the range topping Regal GS (the aggressive red car in the pics), which previously had 270 horses. Below the turbo duo is a 2.4L engine with eAssist light electrification tech. Six-speed automatics are matched with both engines and a six-speed manual is available in the Regal GS. Electric power steering is now standard on all Regals. if we were to dream, i’d dream the vauxhall insignia, not a buick, a rubbish radiator grill and brand nailed on a good car. i know , i was talking abt the design, not the brand..
why is buick a rubbish brand? have you actually driven or sat in a buick before? or your comments are based on what you read online? surely it cannot be worse than your P1. 2, buick is making some of the world’s most rubbish cars, the disgusting lesabre, allure, roadmaster, verano, i could go on forever. and 3 i could say you haven’t driven a buick as well, so your argument defeats your own comment. Oh god why we don’t have Buick here..sure I’ll depart myself for only owning typical japs or korean or german cars!